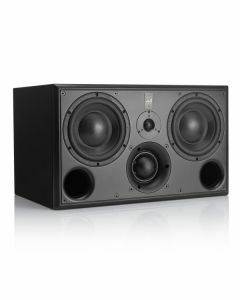 The SCM45A Pro is mid-size very high performance active 3-way studio monitor. SCM45A Pro is a high-performance three-way active loudspeaker; the first of ATC's three-way professional monitor to incorporate their new high-performance SH25-76S dual- suspension tweeter. The SCM45A Pro is a completely new design, yet shares many features with its smaller sibling, the highly-successful SCM25A Pro three-way, compact active loudspeaker. As a mid-size, three-way design that can be used in near- or mid-field positions, the SCM45A Pro perfectly fills a gap in ATC’s high-performance, professional active studio monitoring loudspeaker range. It has high output and delivers extended low frequency for its size — and all without compromising the overall balance for which ATC is so well known. ATC hand built 3”/75mm Soft Dome mid-range driver. 2 x ATC hand built 6.5”/164mm carbon-paper cone bass drivers. On-board grounded source 235 watt Class A/B Tri-amplifier. Compact size with high output and low cut-off frequency. Dimensions (HxWxD): 353 x 600 x 375mm (13.9Ë x 23.6Ë x 14.8Ë). Handles add an additional 39mm/1.5″ to depth.